With many looking to get away this half-term, it’s important not to ignore the alarming increases in burglary and vehicle-related theft recorded in the latest crime report from the Office of National Statistics. With thousands of homes due to be left empty for the week, half-term is a popular period for burglars to strike. However, measures can be taken to decrease the chances of doorstep crime. Before you head off on your half term holidays, it may be worth following these five easy steps to keeping your home safe, provided by smart home security expert Ring. Unsurprisingly, burglars often make their move after dark when they are less visible to passers-by and neighbours. We all know this, however, remarkably, many of us still leave our homes in total darkness when we go away on holiday. This gives opportunist burglars the ideal setting to target our homes. Installing a porch light to come on in the evenings, or better still motion detected smart lights, not only makes it harder for suspicious intruders to stay undetected, it will deter them from even approaching your house in the first place. Some burglars will hang around neighbourhoods to scout out empty homes in advance. No burglar will set foot anywhere near your house if he thinks you’re there waiting to greet them the door. By keeping the curtains open, keeping your car parked in your driveway, or getting a neighbour to park their car in your driveway, you can create the perception that the house is occupied. Security technology has come a long way. 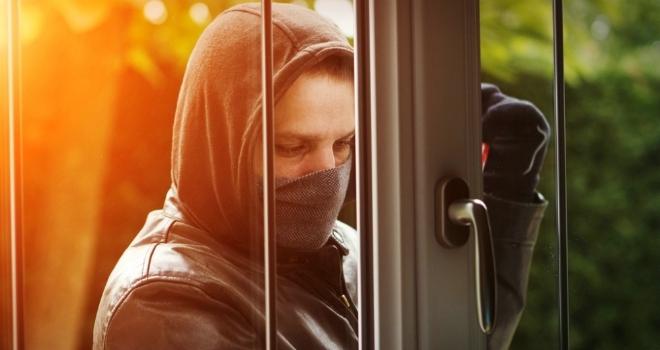 Be proactive – don’t give your burglar ample time to grab and go. Instead, invest in smart connected cameras and doorbell systems to notify you of any suspicious activity outside the home through smart phone alerts. This puts you on the front foot, so you can stay one step ahead - proactive rather than reactive. For example, Ring’s Video Doorbell has a two-way audio system allowing you to shout at any unwelcome guests from the luxury of your sunbed. The more visible you can make your security, the lower the chance of being targeted by a burglar. Burglars are less likely to commit a crime if they know they’re being caught on camera. If you install a visible security camera or smart doorbell you can deter burglars or car thieves from setting foot anywhere near your home. In addition, place signs or stickers in your garden and windows to remind any would-be intruders that they’re being watched. Keep your neighbours in the loop by telling them you’re about to go on holiday so they will be more alert to any suspicious noises or behaviour while you are away. Having someone on hand to check in on the house will also put your mind at ease.